Boeing 737 – Your chance to fly “heavy metal”! This simulator is suitable for everybody, no matter what level of experience you are at, beginner or advanced. Our friendly staff will guide you through the experience so you can really feel what it’s like to be the Captain of a passenger jetliner. We can work with you to tailor a session, anything from a difficult approach and landing at the Kai Tak airport. Take off and land at Newcastle Airport, Fly over London with a flight out of Heathrow. Spitfire – We offer a “Classic Spitfire” experience. Fly over the white cliffs of Dover or shoot down the enemies in an enthralling dogfight. Enjoy the scenery of Northumberland’s coast and castles from the seat of a spitfire. This is a truly immersive experience using the latest 3D headset. Don’t forget the Spitfire cockpit is transportable and would make an excellent feature at a 1940s event, or even a birthday party. Just contact us to discuss your requirements and get a quote. F-35 – We are proud to announce the arrival of the F-35 Thor Fighter Jet Simulator to our simulator center. This is the one and only F-35 flight simulator in the UK available for the public – your very unique opportunity to experience what it feels like to be a Top Gun of the BEST AirForce fighter ever built! Learn to perform short takeoffs, landings and aircraft carrier landings. Our F-35 cockpit is transportable for any events or parties. Contact us to discuss your requirements and get a quote. Santa’s Sleigh Test Flight – All ages £25 for half an hour. 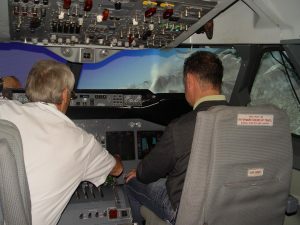 New to the Aviation Experience Company, superb flight simulator experiences in Doncaster. Fly a 737-800 anywhere in the world; guided by experienced 737 pilots who will ensure your experience is the perfect adventure. Once you have got the feel for this aircraft, why not try your hand flying into and landing at some of the world’s most challenging airports or simply practice taking off and landing at Doncaster, Sheffield airport. Do you like to fly flight simulators on your PC at home? Do you get a buzz out of making real time flights around the world. Contact us for details of three or four hour experiences. These are best shared and you can visit with a friend and fly different routes for extended experiences. We spoke to two experienced flight simulator pilots who had just flown Gatwick to Austria and back. They explained how good this simulator actually is. From the weight of the controls to the quality of the graphics and experience. Why not try for yourself, or buy a gift certificate for a friend or loved one. When you book any of our experiences, you have six months to choose the date you would like to take your flight, but you can also post date the start date of your booking voucher so that you can present it as a gift in the future and the recipient will have the full six months to use their gift. Boeing 737 – This fantastic machine was originally owned by Sabena Airlines of Belgium and was constructed by Atkins and Merryl in the USA. After the demise of Sabena, it was bought out and partly converted into a New Generation (NG) 737 simulator. We purchased this machine in 2012 and have since continued with the conversion process so it has a fully funtional instrument and overhead panel. We regularly have current 737 captains fly this simulator and they comment on how remarkably close it is to the real thing. Our graphics are the latest from the USA and our functional software is recognised as the industry’s leading programme. A hydraulic motion option completes this remarkable machine. Similar simulators anywhere else will cost in excess of £500 / hour. 2 observer seats are available. Boeing 747 – This superb machine started life as an Aer Lingus 747-200 training simulator. Since its early days it has been converted into a 400 series aircraft by the addition of the glass cockpit and all the supporting software. This simulator has amazing cinema screen wrap around graphics to give both the flight crew and the observers the best view possible. We often use this simulator to train aspiring British Airways pilots before their interview process, something which we have been very successful with. This is the ‘Queen of the Skies’ and is my favourite of all our simulators. Room for up to 3 observers. Airbus A320 – This is not a simulator. This is a REAL aircraft – G-BUSF – back engineered into a simulator and what an amazing job our engineers have done with it. Scrapped some 3 years ago, this aircrafts nose was cut off and then mounted on a pitch motion platform. Previoulsy operated by GB Airways for British Airways, some of our instructors have flown this actual aeroplane. For one it was his first ever jet flight! 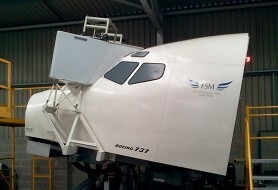 This simulator, like the 737, has professional ‘collimated’ displays which produce high resolution imagery for flight. It’s so realistic that sitting in it you sometimes wonder if you are in a real aeroplane. Room for up to 3 observers. Pitch motion available. A real must for you techy wannabe pilots. The DA42 Training aircraft simulator is a fantastic experience with wrap around display which completely immerses you in this fun simulated flight.